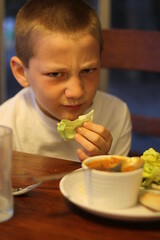 As I recently wrote about on our family blog, we’re having a bit of a shifting of the rules over here at Kid Vs. Produce. I’m realizing that barring an allergic reaction or some sort of other extreme aversion to a particular food, this whole “try it three times and then reject it forever” rule was pretty ill-conceived.Â For some of our What The?Â Foods or seasonal oddities, sure. But for the vegetables and fruits that we use frequently as part of our meals, I’m not willing to give him a pass just because he has turned his nose up at something three times. I’ll be jotting down our amended rules in a bit – but for now?Â It’s Salad Days, babies. See this normal looking plate of food? 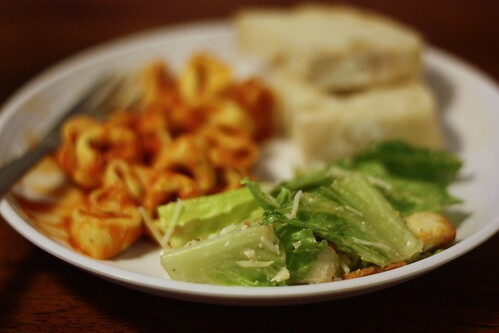 Bread, cheese tortellini with marinara sauce, and a bagged Trader Joe’s Caesar salad. I figured I’d start small, and keep the kid-friendly items front and center. Croutons? Check! Shedded Parmesean? Check! Garlicky dressing? Check! Crunchy, mildly flavored lettuce? Check! Run in 28 queries. 0.430 seconds.